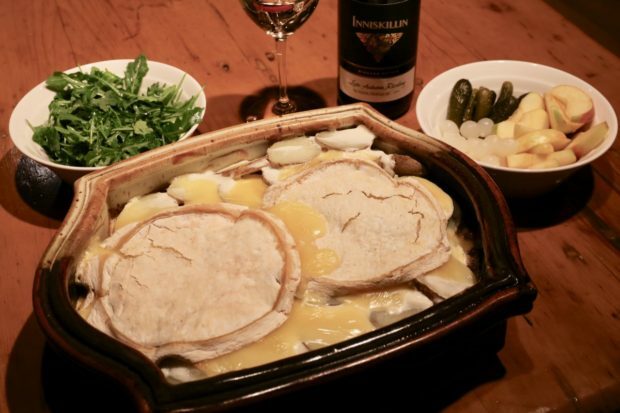 Tartiflette Reblochon is a sublime Swiss winter staple that will impress any fromage loving foodie at the holiday feasting table. Made popular in France’s mountainous Savoie region, the hearty dish is also enjoyed with enthusiasm in neighbouring Switzerland. 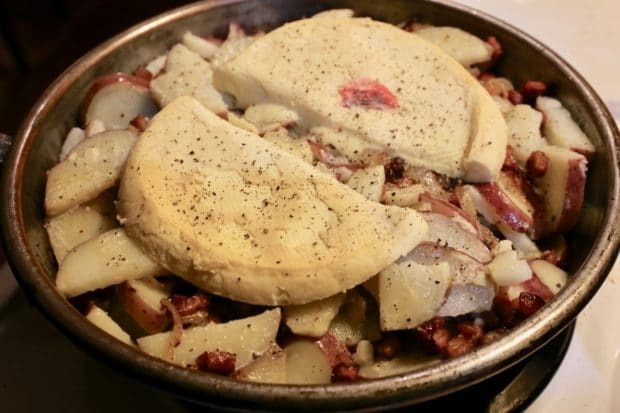 Tartiflette is most often associated with apres ski dining culture, the perfect comfort food during winter. After skiing through plumes of powder in Zermatt, locals warm up by indulging in cheesy fondue, raclette and tartiflette reblochon. Chef Jordan Munn prepares Tartiflette Reblochon in his Toronto kitchen. Tartiflette is one of the most iconic of reblochon cheese recipes. The traditional tartiflette recipe originated as a brilliant marketing ploy. Dreamed up by reblochon cheese producers in the 1980s, their recipe for tartiflette created a new demand for the stinky, wash-rind cheese. Tartiflette Reblochon is made with only a handful of ingredients. Parboiled and sliced potatoes are organized in a gratin dish and layered with a mixture of butter, garlic, onion, bacon, and white wine. There are two schools of thought on the next step: some chefs top the gratin with rich whipping cream while others slather it with tangy crème fraîche. The dish is crowned with a sliced round of reblochon cheese before being popped into the oven. Tartiflette Reblochon is ready to serve once it bubbles and squeaks a golden brown melted cheese! What you’ll need to prepare Tartiflette Reblochon. I learned first hand how to prepare Tartiflette Reblochon at Chef Jordan Munn’s Toronto kitchen. Chef Munn spent his early years working in Toronto’s restaurant and catering kitchens before launching into a career which would have him cooking on mega yachts from Miami to Malta. He’s prepared elegant feasts for American business magnate Sheldon Adelson, Saudi Arabia’s Crown Prince Muqrin Bin Abdulaziz al Saud, and Switzerland’s Baron and Baroness Ullens. Last year Chef Munn worked as a private chef in Verbier, Switzerland and was introduced to Tartiflette Reblochon by the properties grounds keeper. 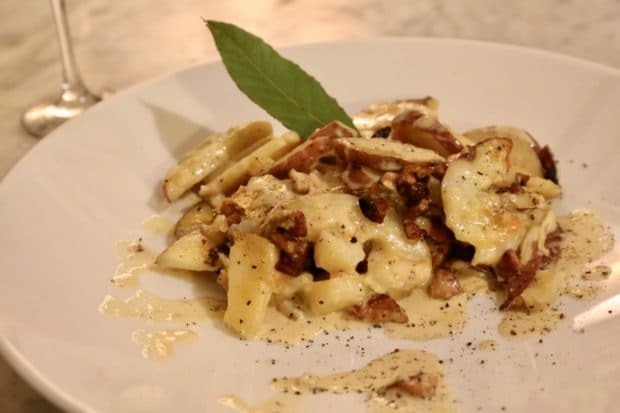 “Tartiflette is very popular in winter, as it’s heavy, rich and satisfying. It’s ideally eaten at lunch during a day on the slopes as it offers a massive fuel boost. It’s a cozy and delicious meal that is guaranteed to warm you up. I love to make this dish at home because it reminds me of the great times I had cooking in Switzerland. For anyone who has a love for potato, onion, lardon and cheese, you’re in for a treat,” says Munn. 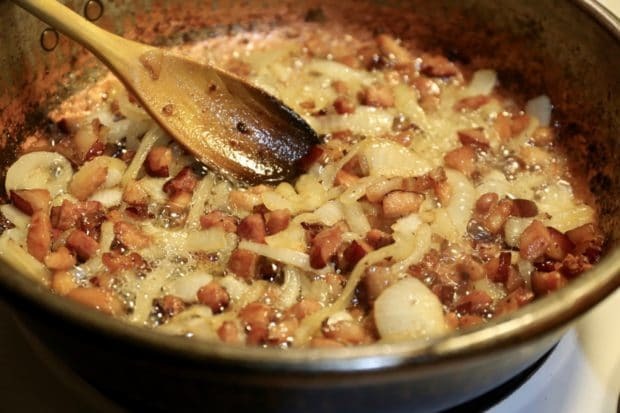 Sautéing butter, garlic, onions and bacon for Tartiflette Reblochon. Reblochon is a French cow’s milk cheese produced in Haute-Savoie located in east-central France, near Geneva, Switzerland. Reblochon is produced in a farmhouse artisanal style by twenty small factories and 180 farmhouse producers. The celebrated cheese is made from the milk of the Abondance breed of cow, which also yields Beaufort and Vacherin d’Abondance. The curds are uncooked, lightly pressed and then aged for 4-5 weeks with regular washings of the rind. Considered one of the world’s greatest mountain cheeses, Reblochon offers a smooth and creamy paste that to the touch can be both rubbery and sticky. 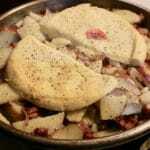 Tartiflette Reblochon is a popular Swiss winter dish that will impress any fromage loving foodie at the holiday feasting table. Parboil potatoes in a large pot of salted boiling water for 5-7 minutes. If you cook the potatoes fully they will become undesirably mushy when baked. Heat a sauté pan until hot and fry the bacon lardon until crispy, 4-5 minutes. Discard melted pork fat from pan and add butter, onion and garlic, cooking for 4-5 minutes, or until golden-brown. Deglaze the pan with white wine and continue to cook until most of the liquid has evaporated. Slice the cooled potatoes thinly and layer into an ovenproof gratin dish, layering with the onion and lardon mixture as you would a lasagna. Pour whipping cream over the mixture and slather with crème fraîche. Tartiflette Reblochon read to pop in the oven. What To Serve with Tartiflette? Tartiflette is Switzerland’s most decadent dish. Crunchy potatoes can be found smothered in puddles of gooey cheese and cream, and given a kick thanks to cracked pepper and smokey bacon. It’s best treated as an entrée, the star of the show, rather than a side dish. 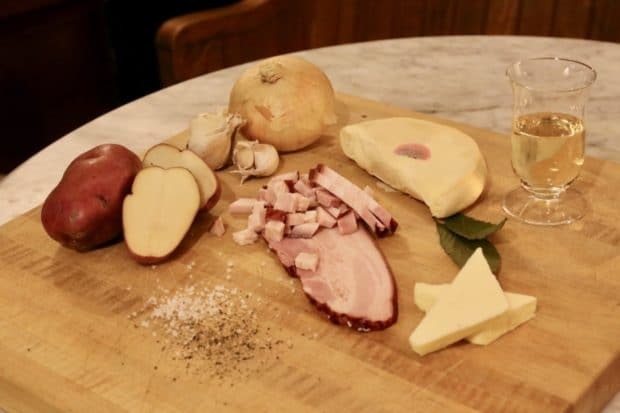 Serve your Tartiflette Reblochon alongside a fresh green salad, glass of dry white wine, and board topped with cured meat, grainy mustard, cocktail onions, gherkins and slices of Gala or Honeycrisp apples. Your guests will ooo and ahh after forking through their first bite of tartiflette. It offers the ultimate satisfaction for those who love potatoes smothered in bacon and cheese. Tartiflette Reblochon served with riesling, arugula salad, gherkins, pickled onions and apple slices. Tartiflette Reblochon is best served with a glass of dry white wine. Need a Tartiflette Reblochon Cheese Substitute? Taleggio: a northern Italian cows milk cheese offering a mild yeasty flavour. Stickier and less runny than brie. Limburger: originated in the Herve area of French speaking Belgium. The cheese is particularly known for its stinky qualities, but don’t worry: it’s flavour is approachable, rich and buttery from whole-fat cows’ milk. Epoisses de Bourgogne: is a famed stinker from France’s Burgundy region, washed in brandy-infused brine. 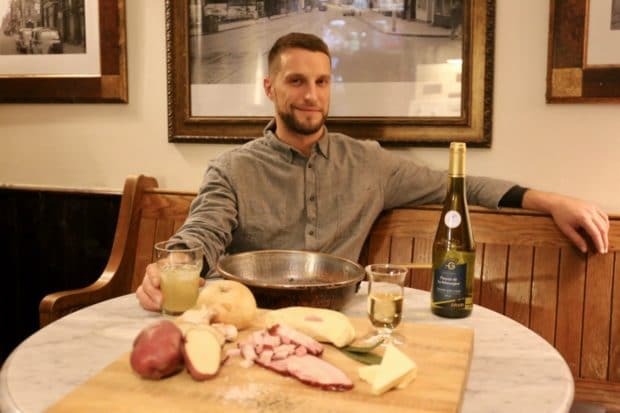 Brie: is a bloomy variety featuring the growth of a soft, white mould on the surface, which differentiates itself from washed rind cheeses like Roblochon. If you’re in a pinch, an imported raw milk brie or camembert will do.